Form Postman add-on: availability to send up of thousands of confirmation emails per day. Backup sender mode helps increasing daily sending. 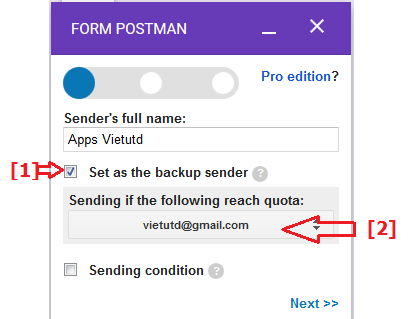 Form Postman add-on for Google Forms: The backup-sender function is available in the free edition since July 21, 2016. Now your Form can send up to thousands of emails per day with this role. The first, assuming that A, B, C Gmails are the collaborators of your Google Form. Let note that Google permits the editor to add up to 50 collaborators to one form.